Who doesn’t love brownies? I think they have to be the most beloved chocolate treat. I truly haven’t heard anyone complaining about brownies. You can find lots of types of cakes in terms of flavors and textures. But brownies? They are as universal as the love they evoke. And the only thing between you and that square is the anticipation for that fudgy, chewy and melt in your mouth bite. The other day we were in need of something sweet and I whipped up this recipe really fast. It was a nice pick me up during a Sunday afternoon, when our energy levels were already on their way down. They require a few steps but they are pretty easy to make. There are zillions of recipes of brownies (seriously, Google told me so). But these are not your out-of-a-box-after-though brownies, these are your you-should-open-your-own-bakery brownies. I called them sponge brownies because the technique to dissolve the sugar and the order of mixing is pretty much the same as a sponge cake. This idea yields a super soft and light brownie with a thin, crispy and super cracked top. 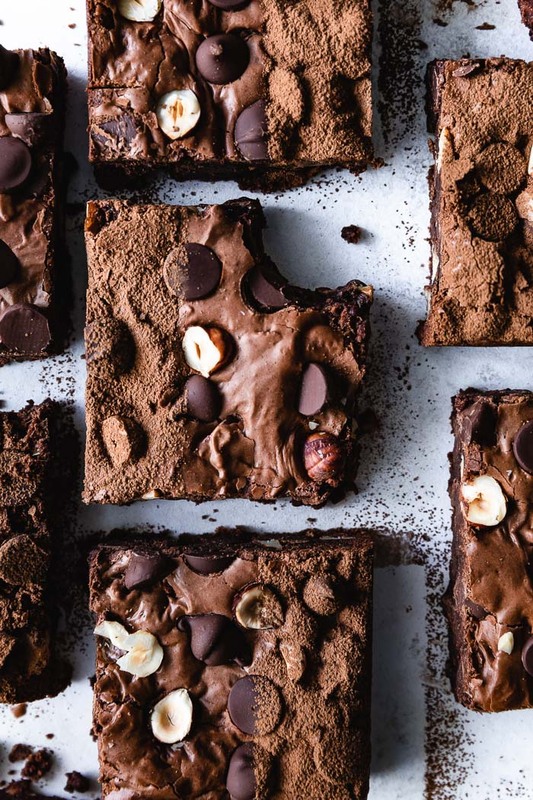 They are more the kind of brownie you would find in a traditional bakery, full of chocolate chips and nuts. No matter the kind of brownie, everyone in my family is always up for them. They are going to be loved forever! 1. For the chocolate chips to fold in the batter I used a mix of semi-sweet and bittersweet. You may use semi-sweet altogether or mix with milk chocolate chips or even mix the three kinds of chips. The bottom line is that you use about 2 ½ cups of chips to fold into the batter. 2. Same with nuts. I used hazelnuts but you may use your favorite nuts or a mix of them. 3. Dust some powdered sugar or unsweetened cocoa powder to add a layer of texture. I preferred to use cocoa powder for this batch. Preheat oven to 350°. Grease or spray with baking spray a non-stick 9” x 13” baking pan. Place a large glass bowl in a large skillet filled with water through half. Put in the butter and the 1 ⅓ cup of the semi-sweet chocolate chips. Bring to a gentle boil and mix frequently until the chocolate is completely melted. Retire bowl from water and set aside to let it cool down. In the meantime, place eggs, egg yolks and sugar in a medium bowl (if using an electric hand mixer) or in the bowl of a stand mixer. Using the whisk attachment, mix in high speed (8 in the Kitchen Aid) for 8 minutes. While the eggs and sugar are mixing, whisk flour with cocoa powder in a medium bowl. Pour vanilla, oil and sprinkle salt on the chocolate butter mixture and mix well. Stop the mixer and add half of the flour and cocoa powder mixture to the eggs and sugar mixture. Gently mix them together, then add the second half and gently mix again until the flour is well combined. Scoop about 1 cup of the flour mixture and mix it with the chocolate and butter mixture. Slowly pour everything on the flour and eggs mixture and gently mix until everything is well combined and the batter has a homogeneous dark brown color. Fold in the remaining semi-sweet chocolate chips, the bittersweet chocolate chips (see notes) and the hazelnuts. Spread the batter into the prepared pan. Bake for 22 minutes, until the top looks set and a toothpick comes out with cooked batter and melted chocolate when inserted through the center of the brownies. Retire from oven and let the brownies cool for a few minutes before serving. You may dust powdered sugar or cocoa powder.